When Simple Mom told me she uses Pear Budget, I knew I'd have to try it. I signed up for a free month, created categories to match each envelope, and tackled that pile of receipts. Pear Budget walks you through each step: Plan. Enter. Review. I'll never go back to Quicken again. Pear Budget gives you running totals in a visually appealing form. Entering receipts by hand provides a visceral system of checks and balances. Big items become manageable chunks with irregular expense categories. If you're struggling to set up a system that works, see if Pear Budget works for you. I'm signing up for a year's subscription. From a tightwad like me, that's the ultimate compliment. Note: this is not a sponsored post, nor did I receive a product for review. I was simply amazed at how easy this month's budget became with Pear Budget, and I couldn't help but share! Thank you, thank you, thank you for the Pear Budget link! Budgets have long intimidated me, but I'm actually excited about using this one. Such a nice, friendly, low-pressure budget, wouldn't you agree? This is much easier to use than Mint.com, which syncs up to your bank accounts. I highly recommend pear budget. It is easy to use and as the month progresses you can print out a 3x5 card that tells you how much is left in each category. The price is nice too..$3 a month..you can't eat at mcdonalds for that price. Thanks for the great advice. I really need to work harder on keeping my budget in check and I will have to look into this. I've never heard of that. Will have to try it out. Thanks! I use Pear Budget too and love it. It's SO SIMPLE! Wow. I just went over there and was very impressed. I can't wait to start using it. I have never figured Quicken out well enough to use it practically. I would be interested to hear more about why you like it more then Quicken. My husband actually handles all our finances and we've been using Quicken for years, we use a lot of their tools so I'm not sure whether it would be worth it to switch over. Looks great - I'll have to check it out. I have a question. it looks like we'll be moving to the Nashville area. DH will be working in Franklin and I was hoping you could offer some info on areas to consider, and especially those to avoid. We have 2 that will be starting high school in the fall and they've gone to small schools up until this point. Is it unrealistic that we are going to find a house, with either a basement or bonus room, a good school district, a reasonable commute, for around $140K? Ditto! We love Pear Budget! I'll have to check it out! I've been a Quicken user for years but some of their features just don't do what I need them to do. Thanks! This looks great, I am going to do the free trial! Thanks for the link! I've tried to use MS Money for years on and off but it always leaves me banging my head in frustration. Way too complicated, even with the downloaded bank statements and all that. Too many tools and options, I think. I do better keeping it all on paper, but Pear Budget may be a good compromise for my husband who likes it all on the computer for some reason. This is a really, really great budget program! I've been limping along in Excel trying to make an envelope format budget because my husband's budget doesn't "click" when I'm out and about. We still stay within our means, most of the time. Yet, we don't always move it to savings, and so it does get spent, somehow. I checked it out and am going to use it for the free month. It seems so simple and straightforward. No excuses, right? I am wondering if any of you use an online check register/type program. I love having things on the computer, but I don't want to just access it from my home computer. Don't know if there is anything out there like this. Pear Budget also has a free spreadsheet version that I am using currently & it's great so far! I didn't realize how much of my income I was really spending until now! This looks neat. Personally, I LOVE Mint.com , but I recognize that it's a little more complicated than some like. I just appreciate that Mint is free and also has a free iphone app. Free is wonderful! Thanks so much, Meredith, for the review! And to everyone who's been checking it out, thanks to you, too! If you have any questions, *please* don't hesitate to contact me (charlie@pearbudget.com) and I'll do anything I can to help you out. Cailleach, can you shoot me an e-mail, and we'll work it out? Thanks! Thanks for this idea. Hadn't heard of the Pear Budget and am intrigued. We will probably be checking this out. Thanks for your blog. You have inspired me. Had never heard of it before, but I just entered our info and it looks so simple! This is what I need. Thank you!! I totally agree! I love Pear Budget! (Also read about it on Simple Mom.) I used to use a spread sheet in Excel, but I will never go back to that now! 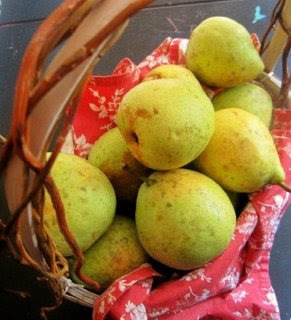 I am not financially sophisticated, so Pear Budget is just less stressful than when I muddled through Quicken and Excel spreadsheets on my own. If you have a system that's already working for you, by all means, be glad and keep doing the good work of budgeting!!! The reason we don't use Mint.com is that I didn't feel comfortable linking my bank account data to an online company. While Pear Budget is online--and you can access it anywhere you go--you manually enter your data yourself. That's part of that checks-and-balances system I like. It reinforces what you're actually spending. Has anyone found PearBudget to be a little buggy? I've been using it since Meredith mentioned it here, but whenever I go back and add categories, it sometimes messes up the dollar column, bumping the amounts a row or two down. Anyone else experiencing this? Good catch. Thanks for mentioning that. It's an issue with the rendering of the data (not the way the database is storing it) ... and if you see it happen you can click to another page in PearBudget (like the Enter page) and then back, and it'll show that it's fixed. Nevertheless, it's not behaving as it should, and needs fixin'. I'm working on that today! E-mail me if there's anything else I can help with! Thanks! Meredith thanks for the info. I'm going to give this a shot! Looks easy and fun - not something you normally find in a budget tool. Meredith - I know this is an older post but I have a question for you. I jumped all over Pear Budget when you posted b/c I've been trying to come with a simple way to budget. I was sooo excited. When I showed it to my husband, though, he was concerned that all our financial data is out there on the net and could be connected back to us (via e-mail address, IP address, or whatever). Did you use an obscure e-mail address when you signed up so the information couldn't be linked back to you? Are you concerned at all about any privacy issues? My husband works in the online commerce industry and deals with hackers who steal people's online data/identities, so I guess this is something that is on his radar. Your thoughts?